Outgoing postcard US-2651090 to Finland shows a vintage cover of the Western Horseman magazine's December issue in 1951. It is the magazine for admirers of stock horses, featuring articles on Western horse riding, horse breeding, horse training, horse ranching, and horse care. 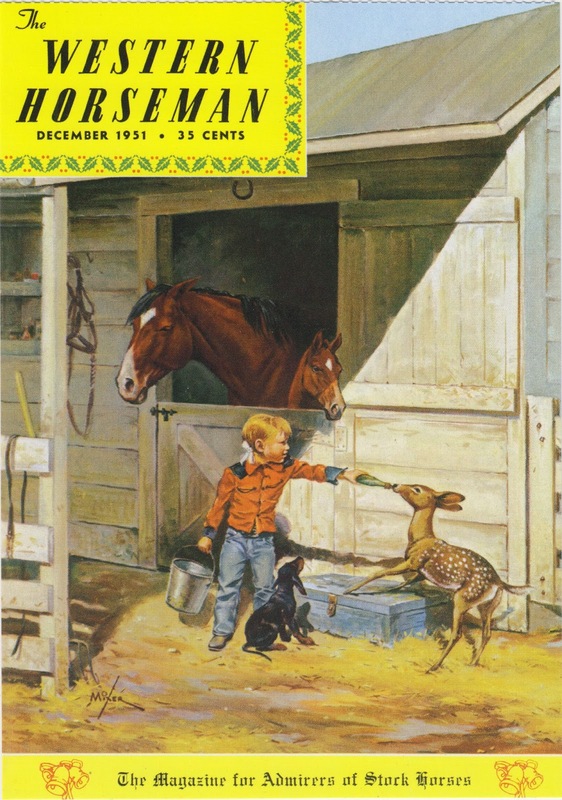 When illustrator Orren Mixer visited the magazine's offices in August 1951, he was asked to paint a cover for the magazine's December issue. The painting arrived, still wet, on deadline day, just in the nick of time. The magazine sells for 35 cents a copy in 1951. The postcard was from a postcard book purchased at the Cowboy Christmas Gift Show during the National Finals Rodeo in 2012.